Ostrava is a city in the borderland of Moravia and Silesia in the Czech Republic. 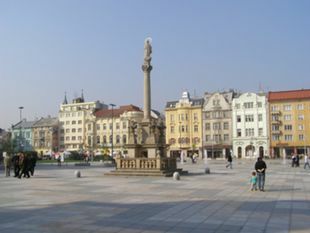 It is the third largest city in the Czech Republic (population 297,400), but the second largest urban agglomeration after Prague. 3½h, Czech Railway's IC/EC every two hours (CZK 295 regular fare, advance online fares start at CZK 149). 3½h, private operator RegioJet every two hours (prices in "Standard" class range from CZK 190 to CZK 325). 3½h, private operator LEO Express every two hours (prices in "Economy" class range from CZK 99 to CZK 499). Olomouc: 1h, IC/EC trains and SC Pendolino (compulsory reservation) every two hours. Beware of some fast trains (rychlík) from Olomouc to Ostrava, they go longer way through Jeseníky mountains for more than 3 hours. Moreover, there are direct connections to/from Vienna, Bratislava, Žilina, Košice, Budapest, Kraków and Moscow. Ostrava has two main train stations, Ostrava hl.n. in the north and Ostrava-Svinov in the west of the city. Fast and international trains stop at both of them. The main bus station in Ostrava is Ostrava ÚAN. Student Agency offers 5 buses a day from Brno, the journey time is 2¾ hours. There are also many charter flights to holiday destinations in Bulgaria, the Mediterranean, Egypt and other places. Check the airport website . There is a regular rail and bus service to/from Ostrava. Download the timetables from here (train)  and here (bus) . Seasonal: Bourgas, Grenoble There is a plenty of car rentals at the airport including Avis, Budget or the private of the airport called GTL LOT Car Rental. The shuttle bus from Katowice Airport operates eight times a day with the timetable fixing the rush hours of the Airport's air traffic. The website of the company can be found here Tiger Express and the tickets prices begin from 9€ one way. The journey takes approx. 2 hours and free wi-fi and luggage transport is included in this price. Public transport (trams, trolleybuses, buses, and local trains) in Ostrava is inexpensive. A 10-minute ticket costs just CZK 16, a 30-minute ticket CZK 20, a 60-minute ticket CZK 28, and a 24-hour ticket costs CZK 80 . The validity of the 30-minute and 60-minute tickets is extended to 45 minutes and 90 minutes respectively during weekends and during bank holidays. You can also pay with your contactless credit or debit card - the tariff conditions differ a little bit, see . Transport is available 24 hours a day, however there is a reduced service between midnight and 4 AM. On weekends you can use one 24-hour ticket for group 2 adults and 3 children at standard 80 CZK price. See a city line map  and online timetable . Ostrava is the shopping centre of the region. You can find small specialised shops, as well as hypermarkets and shopping galleries. You can buy souvenirs for yourselves or for your family and friends in branch offices of the Ostrava City Information Centre. In such a big city the number of restaurants is naturally enormous, ranging from the very famous restaurants to the less expensive trattorie or pizzerie. Whether you are looking to enjoy classical Czech food, regional specialities or international cuisine, Ostrava has what you are looking for. A visit to the region would not be complete without a pint of the local beer, “Ostravar”, which has been brewed in the city since way back in 1897. The main street for wining, dining and having a great time is Stodolní Street, in the heart of the city. It boasts over 60 bars and restaurants in an area covering just a few blocks. Ostrava is home to the famous Stodolní street , the biggest strip of bars and pubs in the country. The city offers a wide variety of accommodation covering all kinds of travel budget and level of service. For more information about the accommodation facilities go to www.ostrava.cz . Citizens of EU can work in the Czech Republic without a work permit, but it is necessary to be registred at a Labour Office (your employer should register you at the beginning of your working stay). There are not so much multinational and English speaking companies compared to Prague. Some major companies have chosen Ostrava as their seat, including Tieto, SungWoo Hitech, ArcelorMittal and so on. The most popular websites to search for a job are Jobs.cz and Prace.cz. These websites are free to use. There are many flexible office solutions in Ostrava that enable you to rent office space for a short term. See for example Regus. There are also a few coworking spaces in Ostrava. See for example Viva Ostrava . This page was last edited on 18 April 2019, at 12:22.